STAHP IT. STAHP IT. For the last time, NO. I do NOT want to build a stupid snowman. And NO. Not even if it’s “really cold outside”. Beg me one more time and I will SCREAM. If you haven’t been asked if you want to build a snowman on social media through your friends’ posts or face-to-face, you are possibly a very lucky person who either has absolutely no access to the internet (in which case, you shouldn’t even be reading this online article) or you are simply living under a rock. I’m sure I haven’t any need, really, to explain this “Do you wanna build a snowman?” craze, but for the benefit of those blissfully oblivious people who have no idea what I’m talking about, this is part of a song’s lyrics. But even Miley Cyrus’ Wrecking Ball didn’t cause as much of a storm as this. So how did this phrase become such a generic term amongst teens? I mean, for Pete’s sake, it’s always summer here. Well, I blame you Frozen. Moving on, how often do you find a Disney Movie which has your friends and yourself singing its song for weeks after that? I mean, you didn’t hear people saying that “Flipping your fins, you don’t get too far…” like how you hear people saying that you should “Let it go”; you didn’t hear people asking if you can feel the love tonight like how you hear them asking if you want to build a snowman; you didn’t hear people duet-ing “…And at last I see the light..” like how you hear them duet-ing “Love is an open door”. Don’t get me wrong, I’m not saying the previous movies were lousy. 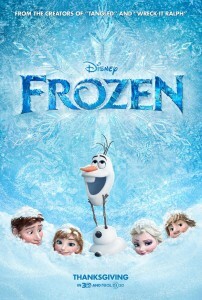 I’m saying that Frozen is indeed Disney’s best marketed and most successful movie. Ignore those minor flaws and you have yourself the perfect Disney movie suitable for toddlers, great-grandparents and anyone in between. This is the sort of film you wouldn’t mind re-watching over and over again. Definitely a winner!